Which EA Review Course is Right for You? With my comparison of the most popular EA review courses, you can get the best course for you! How Long Does It Take to Become an Enrolled Agent? Fast Forward Academy EA Review [My 2019 Review + Big Discounts] Save Now! We’ve got the Fast Forward Academy discount that’s JUST for our readers. What Is the Fast Forward Academy Discount? Save 10% on all EA review! The discount will auto-apply, so just click here; no code necessary! Fast Forward Academy EA Review has built a very intuitive and easy-to-use enrolled agent review course. Some enrolled agents even consider it the best enrolled agent course available. There are a lot of bells and whistles, and the Smart Bundle offers a very good value to EA candidates. 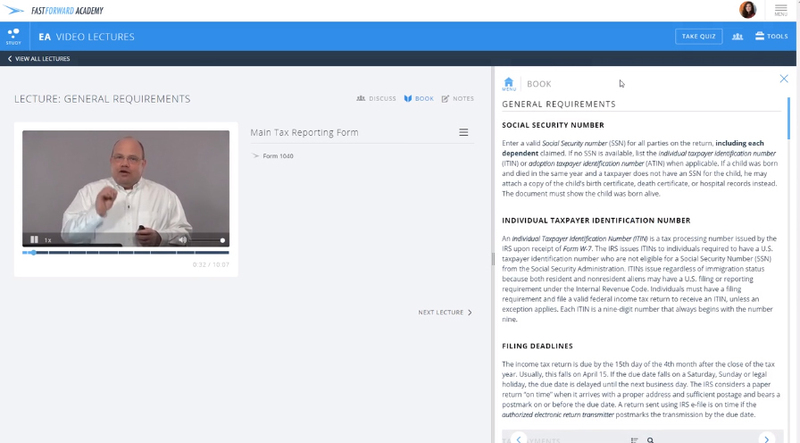 Let’s take a look and see if Fast Forward’s enrolled agent course is right for you. Disclosure: The I Pass Team may earn a small amount of compensation if you purchase from our links; our team uses these revenues to maintain the site and produce awesome free content just for you! Save 10% on Fast Forward Academy EA Now! The Fast Forward Academy Enrolled Agent course targets your weak areas. 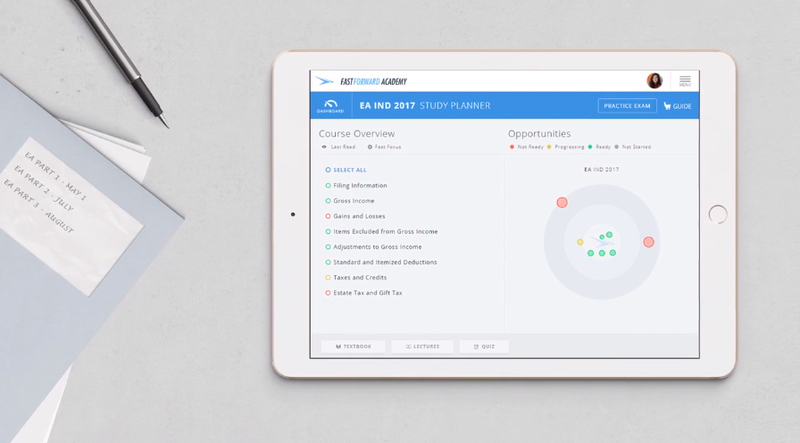 At the beginning of your studies, you’ll notice a bullseye graphic, and your mission is to get all the topical areas to move to the center of this bullseye. And Fast Forward Academy EA Review goes a step farther by estimating your knowledge of the concepts: the course asks you if you are confident with your answer selection before you submit your response. The good news here is that the course isn’t going to reward you for being a lucky guesser; instead, the confidence ranking uses your responses to inform the course (and the bullseye) of your overall understanding. The course also includes a very large test bank with over 3,500 practice questions. Let’s look at many of the ways in which Fast Forward Academy EA is different from another other EA review course. I don’t think any of the above points are cause for concern. And I’m always happy to see a value-add like videos come with a course that already packs a lot of value into such a fair price point. The Fast Forward Academy EA Review’s video lectures also include side-by-side slides of the most important concepts that Brian Hock highlights. Within the lectures, you can also take notes and view the textbook. The lectures also include closed-captioning. Fast Forward Academy EA makes print and digital copies of its textbooks available. What I really like about the digital version is that they are smarter than any other textbook in an EA course. And by smarter, I mean that you can use digital bookmarks, takes notes, build flashcards, and watch lectures – all while using the textbook. No other review course for EA’s has this functionality. Fast Forward also has a vast and active community of other candidates studying for the enrolled agent exam, and you can access this community anytime from within your course. In this community, you can ask questions about a particular topic; furthermore, you can also see questions others have asked. 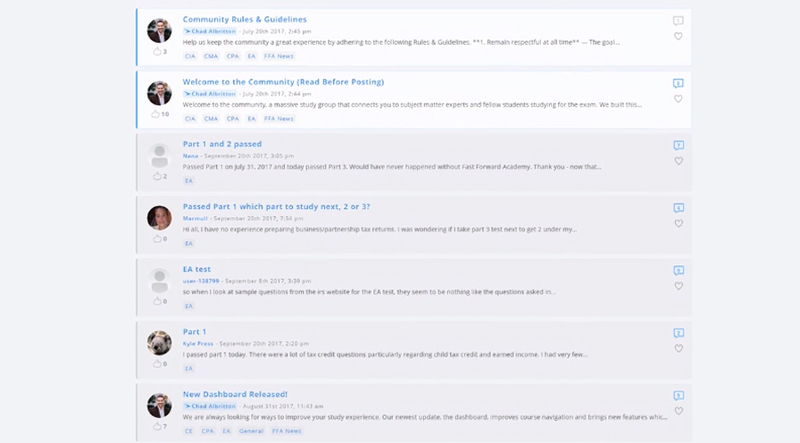 Moderators are in the community and they can provide official answer explanations. But the nice thing is that EA candidates can help out one another. I like this because if you are very confused about a particular topic, you may need various points of explanation before something may make sense. Would I recommend this course? And would I use it myself? Absolutely yes to both questions. I am very impressed at what the team at Fast Forward Academy EA Review has put together for EA candidates. And while I did find some limitations, I do not think they materially impact the course. There are several options from which you can choose, although the free trial will give you a feel for the EA Smart Bundle, and I’ll cover that below. As you can see, the biggest difference between the EA Smart Bundle and the EA Online Course is the printed textbook that comes with the Bundle. The EA Online Course has textbooks, but you will only be able to access them from inside the course. Additionally, the EA Smart Bundle includes free domestic shipping on your textbook. The Enrolled Agent Study Guide is just the textbook, and I would only recommend purchasing this option if you wanted a supplement. The other two options are going to be the way to go in terms of value, and also, they include access to the innovative course that will provide you with unlimited practice exams. 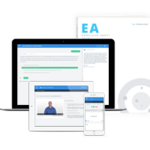 Save 10% on Fast Forward Academy EA Review Now! Are you an FFA EA fan, or do you have a question about this course? Leave us a comment below! Save 10% on EA Review Now!